It doesn't get better than this! Rippling sand, waterfront property, gazebo with 4 person hot tub, natural-stone fireplace in one cottage, comfortable beds, kayaks, row boats, quiet side street (not main road). A 10 person Crest II pontoon rental available. Two 40 ft docks. Water on one side, woods on the other. Walk to: Pick berries up the hill, restaurant, snowmobile, ORV and sandy dune hiking trails, quiet, peaceful, and shaded. Fire pits by water, bench swings, picnic tables, and Adirondack furniture. Wood decks and the best sandy water on the lake. Walk out over 300 feet (no muck, no critters). Walleye hole is only a few hundred yards away! Relax by the water under the shade of our White Birch and Cedar trees. Enjoy the beautiful view of peaceful Black Mountain and a breathtaking sunrise over the lake. 'All Sports' 10,130 acre Black Lake has the best fishing and water sports as well as snowmobiling, cross country and downhill skiing close by. You can walk out 300 feet from home in pure gold Michigan soft sand. Easy to find on year round plowed road. Five minutes to UAW Resort with premier public golf. 8 by 10 Wood floating dock can be moved to any depth in the lake. Ocqueoc Falls is close by; kids love spending the day playing in the waterfall. Only 30 minutes to the Mackinac Bridge, historical Fort Michilamackinaw, and shopping. Enjoy evening waterfront campfire and the outdoor 4 person hot tub in screened octagonal gazebo. There is a complete kitchen, gas heat, field-stone fireplace and air-conditioning. Wi-Fi included plus enjoy TV with Cable -- over 40 channels! Front secluded road safe for kid’s bike riding. Amish made 16x12 Log Cabin with rocking swing porch handles overflow. Hammock, wood swings, and picnic tables. Two rowboats with life jackets, your own 40-foot dock - great for sun bathing. Bring your own boat or rent ours - there's plenty of docking room! Lake has a waterfront restaurant (The Bluffs - excellent food; dine on their beautiful patio overlooking the lake.). Deer, ducks, turkeys can be seen on or near property (seasonal). Snowmobile, cross-country, ORV trails right across the road, with Black Mountain State REC right around the corner with campground. Both cottages have new wooden-look laminate flooring. Cottage 1 has a beautiful stone fireplace. Cottage 2 has an electric heater with faux fire-place look (in addition to whole-cottage gas furnace). Homes only allow 5-6 people max, with 2 parking spots at each home (plan accordingly with trailers -additional parking options available, please inquire). Boat launch is about 3-4 miles down the road at now-closed marina (although marina is no longer open for business, the ramp is still open/usable). If you wish to bring a pet(s), please make arrangements with owners. They must be leashed, good-natured and completely trained (no more than 2 total). Don't want to cook? Walk up the hill to Lorenzo's Italian Restaurant. No need to drive anywhere; kick back and relax! **Please note** Towels and bed linens not included. Beds have pillows & blankets, but you will need to bring kitchen & bath towels as well as sheets & pillow cases. My wife Theresa and I were introduced to Black Lake 18 years ago. We fell in love on the first day there and decided that when the time was right we would own property on the lake. 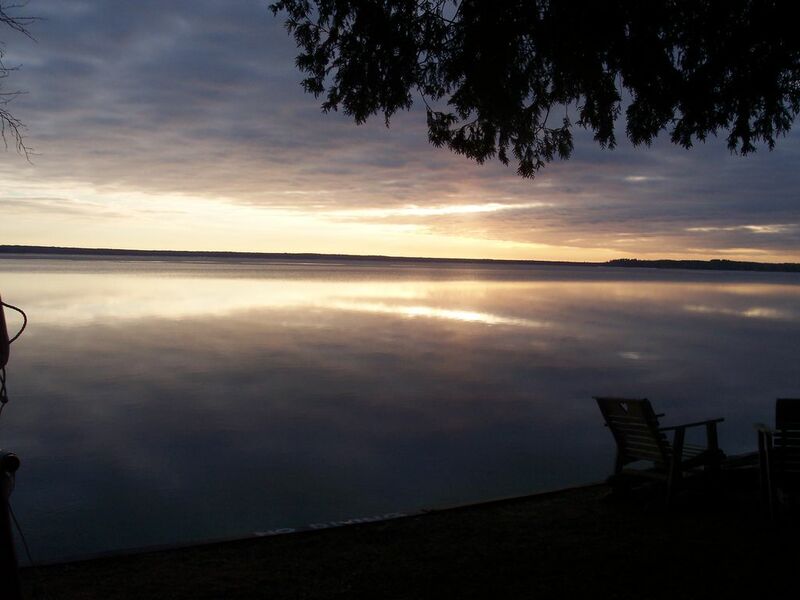 We were fortunate enough to find these wonderful cottages that we can not only use when travelling to the lake with family and friends, but that we can share with other families so that they can enjoy the lake as much as we do. We are an ideal place for families to gather. The separate cottages allow everyone to enjoy being together, yet still have their own space when it's time for a quiet nap. This is the best side of the lake in summer. The wind generally comes out of the west, and we have a hill protecting us. It is typically calm here and wavy on the east side when the wind picks up. Walk out over 300 feet with a gradual depth increase over hard packed sand. This gradual increase is great for kids. We have a hot tub for 4 if you're getting cold or want to have some time away from the kids and just relax. We are on a quiet safe side street, not the main road (Black River Rd.). You are close to everything; walk up the hill and across the road and there is a restaurant, the state ORV Trails, and sand hills. No need to go anywhere else! We have it all right here: fireplace, cable tv, outdoor hot tub in a screened-in gazebo. This property is perfect for youth groups, family reunions, or a girls' or guys' getaway. We supply some toilet paper and liquid soap for bathrooms. Guests must bring their own kitchen & bath towels and washcloths. Bathroom has shower, sink, and toilet. Ken's Market in Onaway is a great place to grab groceries. There is also a Wal-Mart and a K-mart in Cheboygan. Maps to both are provided in the cottage information book on table in cottage. Don't miss the gorgeous sunrise over the lake. Enjoy your coffee on the swing or sunbathe on the dock. Cottages sit on the shore of Black Lake. There are steps from the yard down into the lake (there is a seawall along the shore line to prevent erosion). Beautiful clear water and sandy bottom! Air conditioning in both cottages and bunkhouse. Forced air heat in both cottages. Radiant heat in bunkhouse. 2 miles down the road is the UAW public golf course. This course was ranked #44 in Golf Digest’s “100 Greatest Public Courses in America” in May 2012 and placed #9 in the Best Value category. Outdoor, screened-in hot tub will fit 3-4 adults. Please be careful to rinse off sand before using hot tub. Great vacation spot for a large group. There were 14 of us, 9 adults and 5 children. There was plenty of room for all of us. The children loved the water and having a raft for them to jump off of was a lot of fun for them. The kids also spent a lot of time in the sandbox. We rented the pontoon and really enjoyed driving around the lake. We took the kids fishing a couple of times and they had fun catching some fish, although they were too small to keep. The fire pits were fun to sit around in the evening and make s’mores. We did a few day trips away from the cottages and enjoyed them. Theresa and Kent are wonderful people to rent from. When we called them about a couple of things, they responded immediately. We would definitely rent from them again. Pro's: Screened in Hot Tub, Bright yard at night with tiki lights, Played Corn hole under the lights, Nice fire pits, burned all 7 nights, Close access to ORV Trails, very reasonable Pontoon boat rental, Good sandy bottom, shallow for 300ft, extra cabin in back, Good Fishing, Pike, Small Mouth, Sunfish & Rock Bass, pet friendly, good price for the large group of people, AC was nice all week. Great time by all, made lots of memories, went to the local waterfalls, weather was great, Good Fish fry at the end of the week. Owners Kent & Theresa were very prompt in answering all questions I sent them. Very clean. Lots of places to sleep. We had a group of 13 adults and 7 children. There was ample room for everyone to sleep with beds, futons, and fold out couches. The yard was well maintained and there was lots of place for the kids to play. The sandbox was very nice for the kids as well. The older kids liked the paddle boat and the kayaks. All the kids enjoyed jumping off the floating dock. We love Black Lake and the fact that is clean and shallow for the kids. We will definitely consider renting again when we return. Not fancy, but definitely fun! We really enjoyed our stay here. There was so much to do between several boats, swimming, hot tub, camp fires, relaxing on the swings or in the hammocks. This is a great spot if you are looking to take a break from stress. A couple of things to note is, there are only two bathrooms ( no bathtub on property) between all the cabins and there is no washer/dryer. These cottages and bunk house were awesome. We had everything we needed. The outdoor space was a great place to relax and enjoy the sun or shade. The lake stayed shallow so it made it great to play Frisbee or water ping pong. The kayaks and paddle boat were great. Plenty of chairs for sitting around the fire pit. It was great to have s'mores and hot dogs over the fire. Plenty of space for the group we had there. We only had one night that the weather drove us inside. Grab your cup of coffee and a chair and enjoy it on the dock. Sunrises are awesome. Kent and Theresa are awesome host. Thanks for the chance to spend a relaxing week in your cabins. Will come back if I get the chance. We wanted relaxation and we were not disappointed. Everything we needed was on hand and available for use. We couldn't have asked for a nicer place to stay. The sun rises were majestic. The hot tub was relaxing and the view is great. Located on nice quiet side street off main road (Black River Rd. which can get busy) . Kids can ride their bikes on our road or walk feeling very safe. There is a woods and hill between house and main road. 2 miles from excellent course at the UAW; great dining at UAW Golf Dining room. Both are open to the public! They have a great Brunch on Sunday. Yes we have wi-fi as well as 2 TV's with Cable (over 40 Channels!). Other Activities: River Kayaking, Ocquaoc Falls waterfall is an awesome place to take the kids. BR B Area: /B BR Only five minutes to Black Lake Premier Public Golf and UAW Resort. 45 minutes from Mackinaw City, and a short ferry ride to Mackinac Island. Walking distance to Lorenzo's Italian Restaurant (open Thursday through Sunday only). Ski, ORV, Snowmobile, Hiking, Biking, Fishing, Swimming all from this location.